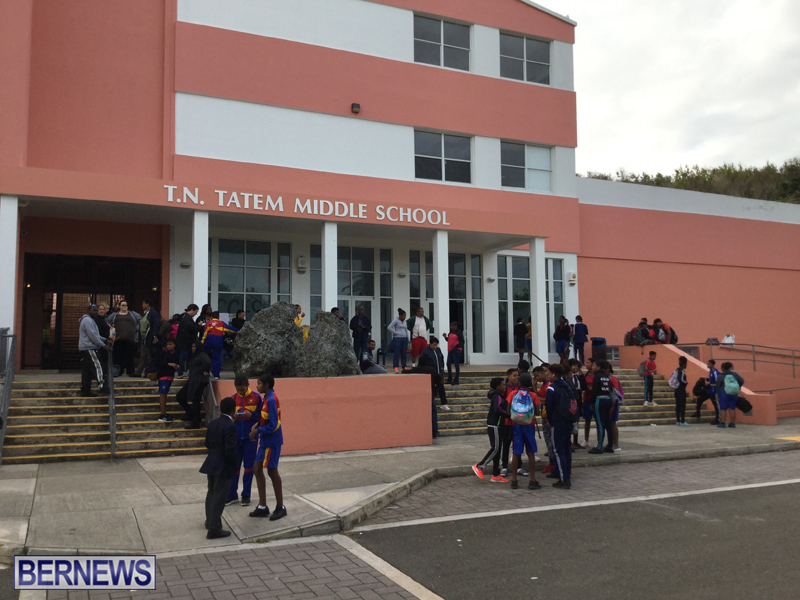 [Updating] The issues surrounding the condition of the TN Tatem Middle School building continue this morning [Dec 2], with students and teachers gathered outside the school, and it appears they do not plan to enter the school building at this time. There have been ongoing issues regarding the school’s condition, and the School Facilities Inspection Report was recently released, detailing problems including signs of roach infestation, moldy stench inside room from poor ventilation and missing ceiling tiles. The 13-page report [PDF] also lists broken and unserviced air conditioning unit with mold, broken electrical sockets with exposed electrical wiring, missing ceiling tiles with exposed electrical wiring, urinal plumbing pipes shows sign of algae growth, leaking pipes, moldy cupboard drawers with insect/pest infestation and more. Earlier this week, Minister of Education Wayne Scott said: “I have met with the Government Health and Safety Officer to review his facilities inspection report at T. N. Tatem Middle School. “The Health and Safety Officer has advised that school building is safe to be occupied and there are no imminent health and safety concerns based on the report. “This report, however, underscores the need for thorough cleaning, electrical repairs, and repairing leaks and replace damaged ceiling tiles amongst other maintenance issues. “I have asked our facilities team and the Ministry of Public Works team to prepare a full plan by December 9th including a timeline for addressing all items that been identified in the report. “I can assure parents, teachers, staff and students that we will address these within the timeframe that has been set by the Health and Safety Officer,” Minister Scott added. This is one of two developing matters this morning, with people also gathering at the House of Assembly grounds to protest the planned airport legislation. The situation at TN Tatem Middle School is still ongoing at this time, and we will update as able. 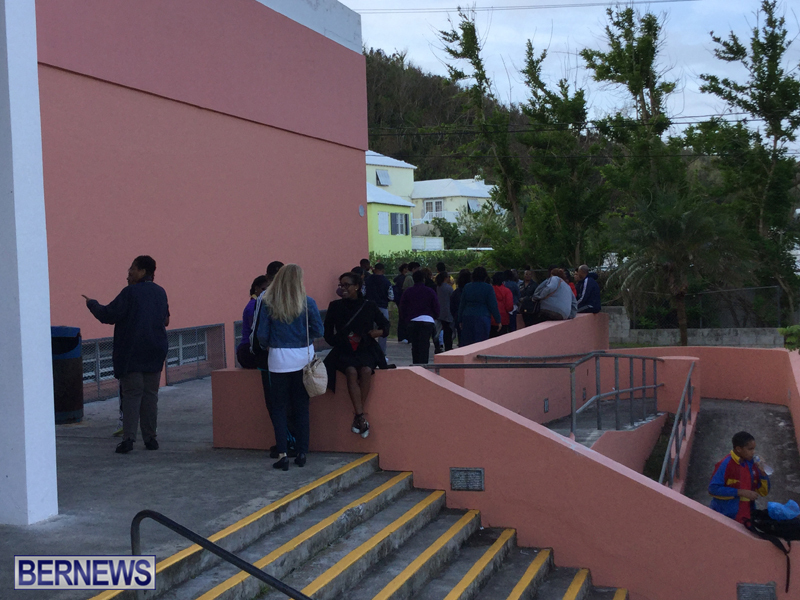 Update 9.25am – Report from Don Burgess: Students and staff showed up at T.N. 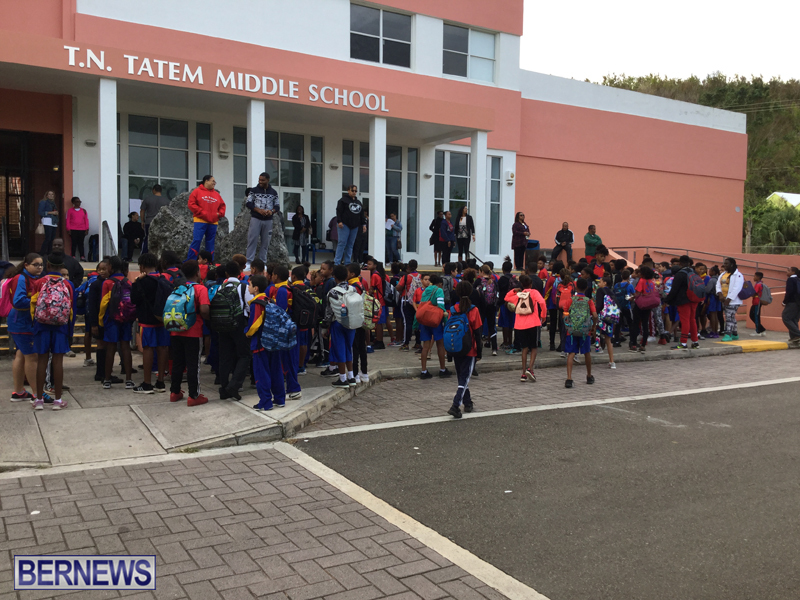 Tatem Middle School but did not enter the building as a sign of protest over a myriad of health and safety issues. 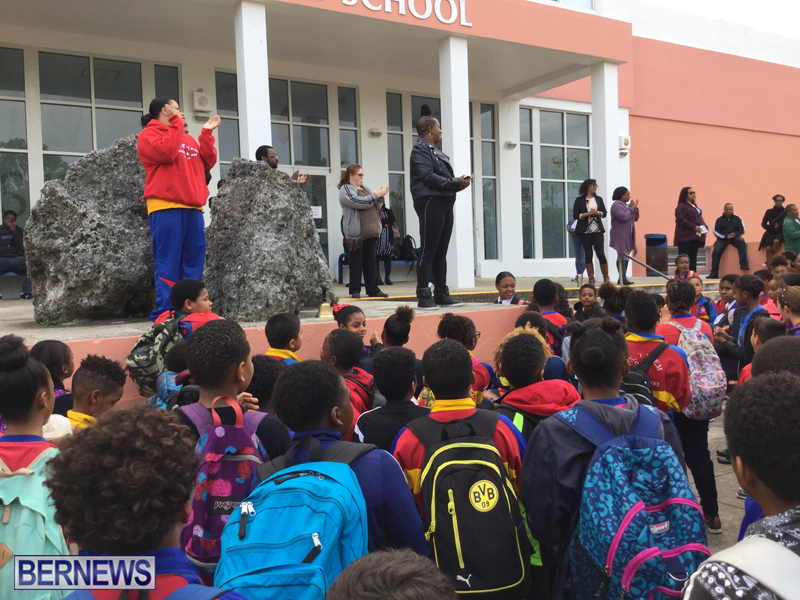 That decision was taken on Thursday evening after a two-hour meeting which involved Education Minister Wayne Scott. The Ministry has a noon deadline today to meet the demands of the staff, PTA and parents to address the issues. An alternate site is being looked at to hold class for two weeks while the school is being thoroughly cleaned. 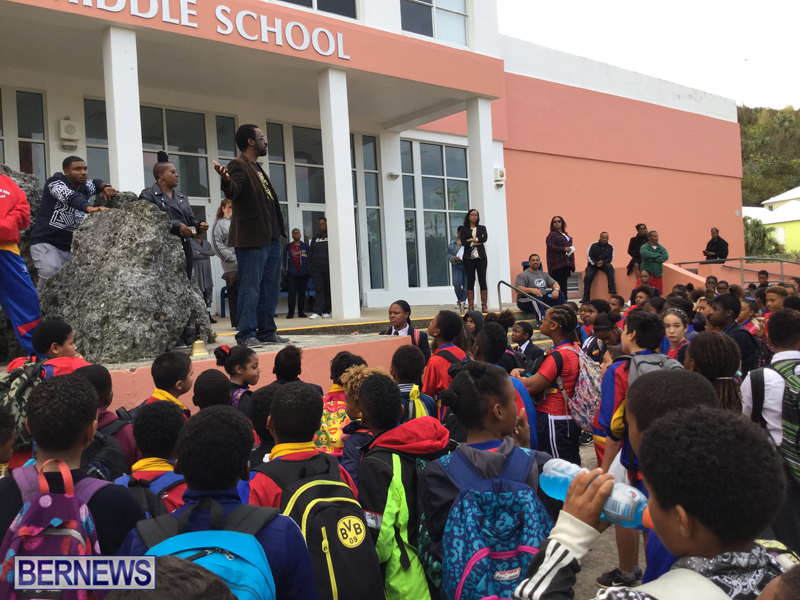 The Ministry proposed Clearwater Middle School as a site but it was rejected by staff and parents as being too far to get students to every day. Bermuda College was also ruled out as a site as it will be in the midst of exams. A staff member told Bernews they want to emphasize that it is not about skipping school for two weeks as they want to fill their duty in educating the students. Update 11.32am: Minister of Education Wayne Scott said, “Our school teams are currently monitoring the developments taking place at TN Tatem and providing assistance to the principal where needed. We are also taking action on some of the urgent items outlined in the report. “I am also releasing this independent air quality report [PDF], as it was requested as part of the outcome of a meeting that I attended last evening with teachers and parents at TN Tatem. I want to stress, that under no circumstances do I want this report, in any way, to minimize the concerns around TN Tatem. They should all march on the House today as well! What a day! The Governments of Bermuda has been a dismal failure!! That includes the UBP, PLP and OBA! Since the ‘government’ represent the majority of the electorate, what does that say about you, your friends and family? Wasn’t the school given the all-clear after an air quality test was done? If so, the teachers have a choice: work or quit. Make room for other teachers to get jobs if they don’t want to work there. Employment is at will. You are pathetic! Your own government representative knows there are health issues concerning this school. You are sad to make it seem like the teachers are the problem. I’m sure you wouldn’t put your health at risk to teach Bermudian children..lets be real! This is not only a problem for the teachers its a more serious problem for the children,the future of this country! Most of these teachers have had a more positive impact on these kids lives then you will ever have! So continue to hide behind a screen name like a loser and post your negativity. OK Mike – tell me this: did you drop your kid off at school this morning?? If it’s such a health risk, why would you subject your kid to it? Did you give him a a pack of smokes and a sippy cup full of anti-freeze too? Pics show a lot of kids were dropped off to go learn in this death trap of a school. It either can’t be all that bad or you guys are all really bad parents. Your kids, if you have any, must go to private school, hence the stupid remark because it really doesn’t affect you does it? If your kids attended TNT you would be angry too. Take your non-caring, stupid comments somewhere else. Why is it only Public schools and government buildings that have this mould? I’M NON-caring? I’m not the one who keeps sending my kid to a school that is supposedly a risk to his health. So who’s not caring? As a single mother of one child entering middle school next year, I am now somehow going to have to pull money out of my a$$ to send him to a private school (that is, IF he qualifies to enter, keeping in mind that an honor roll student at a public school unfortunately is not the equivalent to an honor roll student at a private school), all because I refuse to send him into a mould infested building, that could affect his health, which our government turns a blind eye to. What happens to those who arent able to do that? What are they supposed to do? Leave their kids home for weeks, months or years until something is done? Then have the authorities questioning why their kids are not in school? Unfortunately protests, walk-outs and now riots have become the only way to get heard by a government who simply does not care and an opposition who only thinks about their own pockets and getting back into power. Both parties need to put their arrogance aside and work together. I totally support those parents and students who showed up at TNT and are fighting for the right to an education in a decent, healthy atmosphere. Something needs to happen island-wide, where children and education are a priority, because guess who will be putting us all in the old folks home if we dont show these kids that we care? So should the students all quit too? Brilliant solution. I guess this says your children don’t attended public school. So I guess it is fine for our children to suffer or to get sick. The school should get their own independent assessment done. I don’t trust those in power. Bermuda is a subtle corrupt place. What a great example of the level of ‘professionalism’ in government run schools. first of all they should have caretakers at the school on a daily basis which I am sure their duties include looking out for stuff like this mold and smells. It amazes me, they just paid out a huge lump sum of money to an ex police officer who suffered health issues due to mold in the old police station. You think that they would put the health of the educators and Bermuda’s “future” (the young children) first. Let a parent not have their child/ren living in a “healthy” environment and they’re sanctioned to the courts, child/ren possibly removed from the homes, but the Government is not punished for their negligence?!!!! Clean these schools and buildings, maintain them properly. If things are maintained properly, it will eliminate mass issues and things can be caught early to avoid health issues etc. The government can deceitfully do up the airport deal with this foreign company but can’t put things where they matter first? DO BETTER!!! These children deserve more than what they are being handed!!!!!!! In the face of reported incidents of ill health and clear symptoms of sickness, how can the Government in good consicence say the conditions at the school pose no immediate health risks and the rooms are safe to occupy???? Unless they can confidently say that the recent cases of illness have a root cause other than the building’s conditions, they need to prevent access until necessary repairs are made. OK they got a air quality test and did not test the mold itself that they found. Four classes are still closed because of it. Classes are disrupted. Anyone want to meet me at the school on Saturday! If its not a issue the lets take a walk! I would like to see this mould and check I don’t have it in my house. @ FACTS, what you need to do is get your FACTS straight before you talk. Teachers and students are ill at this school, and the Teachers, Students and Parents are standing up for what is deserved, a good clean, working and learning environment. The Premier is getting his building clean and safe. Another blatant disregard for the people. STAND FIRM TATEM.